aFrom the Toshiba Stroke and Vascular Research Center (H.M., V.M.T., J.X., A.S.)bDepartments of Mechanical and Aerospace Engineering (H.M.)cNeurosurgery (H.M., J.X., A.S.)dBiomedical Engineering (H.M., V.M.T. ), University at Buffalo, State University of New York, Buffalo, New York. aFrom the Toshiba Stroke and Vascular Research Center (H.M., V.M.T., J.X., A.S.)dBiomedical Engineering (H.M., V.M.T. ), University at Buffalo, State University of New York, Buffalo, New York. Summary: Increasing detection of unruptured intracranial aneurysms, catastrophic outcomes from subarachnoid hemorrhage, and risks and cost of treatment necessitate defining objective predictive parameters of aneurysm rupture risk. Image-based computational fluid dynamics models have suggested associations between hemodynamics and intracranial aneurysm rupture, albeit with conflicting findings regarding wall shear stress. We propose that the “high-versus-low wall shear stress” controversy is a manifestation of the complexity of aneurysm pathophysiology, and both high and low wall shear stress can drive intracranial aneurysm growth and rupture. Low wall shear stress and high oscillatory shear index trigger an inflammatory-cell-mediated pathway, which could be associated with the growth and rupture of large, atherosclerotic aneurysm phenotypes, while high wall shear stress combined with a positive wall shear stress gradient trigger a mural-cell-mediated pathway, which could be associated with the growth and rupture of small or secondary bleb aneurysm phenotypes. This hypothesis correlates disparate intracranial aneurysm pathophysiology with the results of computational fluid dynamics in search of more reliable risk predictors. Intracranial aneurysms are pathologic outpouchings of the arterial walls. An estimated 5%–8% of the general population harbors intracranial aneurysms,1 though the exact prevalence is unknown because most are asymptomatic. Aneurysm rupture is the most common cause of nontraumatic subarachnoid hemorrhage, a devastating event that carries high rates of mortality, morbidity, and disability, as well as high health care costs. Despite significant improvement in the clinical care of patients with subarachnoid hemorrhage, one-quarter still die, while roughly half of the survivors live with persistent neurologic deficits.2 The estimated annual cost for hospitalized patients with unruptured intracranial aneurysms in the United States is $522,500,000, and $1,755,600,000 for patients with subarachnoid hemorrhage.3 Recent advancements and increased use of neurovascular imaging have augmented detection of asymptomatic unruptured intracranial aneurysms, amplifying pressure on clinicians to decide which unruptured aneurysms to treat. This decision is not taken lightly because an overwhelming majority of intracranial aneurysms will not rupture,1 while both endovascular and microsurgical treatments carry the risk of associated morbidity and mortality. Consequently, there is a real need for objective aneurysm rupture risk assessments that could reliably predict those at highest risk and subsequently select only them for intervention. To this end, investigators have tried to identify aneurysmal characteristics that are associated with intracranial aneurysm growth and rupture. Hemodynamics is one of most widely accepted factors contributing to aneurysm pathophysiology, playing a fundamental role in the mechanisms of initiation, growth, and rupture.4⇓⇓⇓⇓–9 Recent studies using image-based computational fluid dynamics (CFD) modeling and statistical analyses have identified connections between the hemodynamic properties of intracranial aneurysms and the likelihood of their growth and rupture.5,9 Such findings have highlighted the exciting possibility that aneurysmal hemodynamics may provide objective metrics to improve rupture risk stratification. A number of engineering and computational researchers have published CFD studies associating specific hemodynamic parameters with intracranial aneurysm growth and rupture.5,7⇓⇓⇓⇓⇓⇓–14 While clinicians welcome such effort, the growing number of proposed parameters remains inconsistent and confusing.15⇓–17 The most highlighted and controversial parameter has been wall shear stress (WSS), the frictional force exerted by the flowing blood tangentially on the vessel lumen. Both high and low aneurysmal WSS have been separately correlated with intracranial aneurysm growth and rupture.16 This controversy is highlighted by findings presented in Fig 1. Examples of aneurysm growth (A and B) and rupture (C and D) correlated with high wall shear stress and low WSS. A, In a serial study consisting of a baseline and 4 follow-ups, Acevedo-Bolton et al10 found that the maximal growth region (1) of a giant basilar fusiform intracranial aneurysm consistently had the lowest WSS. B, Sugiyama et al13 reported 2 adjacent growing aneurysms, with different hemodynamic characteristics and growing patterns in 1 patient. The proximal growing aneurysm (2) was subjected to local high flow in the growing lobe, while the distal aneurysm (3) was associated with low and oscillatory WSS in the entire aneurysm sac. C, From multivariate statistical analysis of 119 aneurysms, Xiang et al5 found that intracranial aneurysm rupture could be predicted by low WSS and high oscillatory shear index. D, Castro et al11 found, from analysis of 26 aneurysms, that intracranial aneurysm rupture was correlated with high maximum WSS. Images were adapted with permission from the cited references. 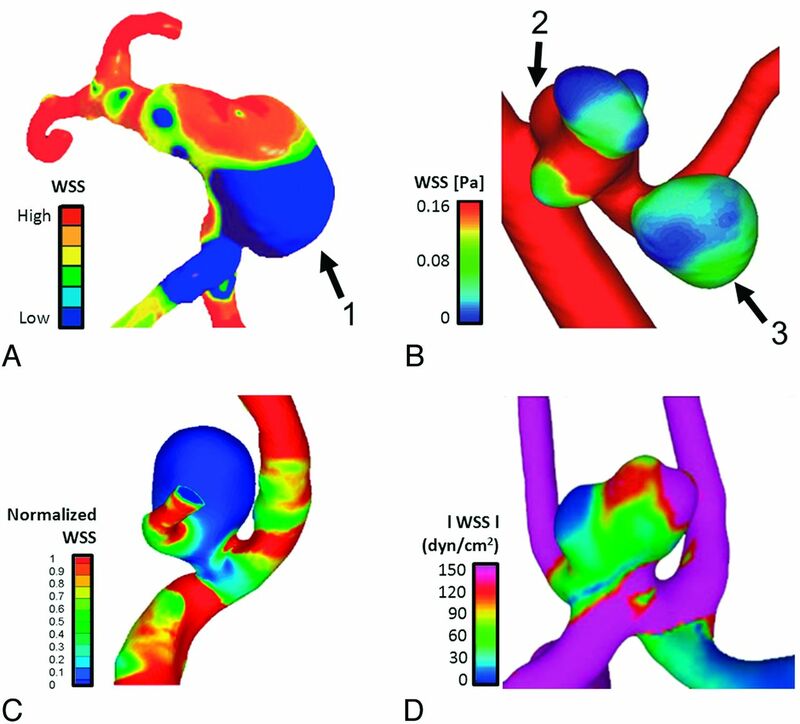 Presently, it is unclear whether the “high-versus-low WSS” controversy stems purely from study limitations, such as skewness due to small sample sizes, inconsistent parameter definitions, flawed experimental design, variability in assumptions and compromises in CFD, or from the inherent complexity and heterogeneity of intracranial aneurysm growth and rupture mechanisms.16,17 How high WSS and low WSS might be involved in aneurysm development remains unclear because the biologic mechanisms underlying growth and rupture and their interaction with hemodynamics have not been clearly elucidated. In this review, we provide a novel view of aneurysm development and a unified hypothesis regarding the mechanistic role of both high and low WSS in intracranial aneurysm growth and rupture. Aneurysm Development Is a 3-Way Interactive Process Driven by Hemodynamics. In clinical practice, aneurysmal geometry (especially size and aspect ratio) has been the principal parameter used to gauge the rupture likelihood of intracranial aneurysms.18 However, hemodynamics provides mechanical triggers that are transduced into biologic signals leading to this geometric evolution. Aneurysmal geometry and hemodynamics are mutually causal: Geometry instantaneously determines flow conditions, while flow drives aneurysm remodeling/growth through pathobiology, thereby determining future geometry (ie, enlargement and shape change). As this process continues, an intracranial aneurysm will either grow until homeostasis (stability) is reached or until its wall strength can no longer withstand the hemodynamic stress, in which case rupture occurs. This is best illuminated by a triangular relationship among geometry, flow, and pathobiology (Fig 2A). How hemodynamics plays into intracranial aneurysm dynamics. A, Three-way relationship of aneurysmal geometry, flow, and pathobiology. Flow exerts mechanical forces on the vessel wall, eliciting cell-mediated biologic pathways. Sustained changes in flow (thus WSS and pressure) lead to remodeling of the wall, resulting in aneurysm geometry change. In turn, geometry determines the flow, which could drive further biologic processes. 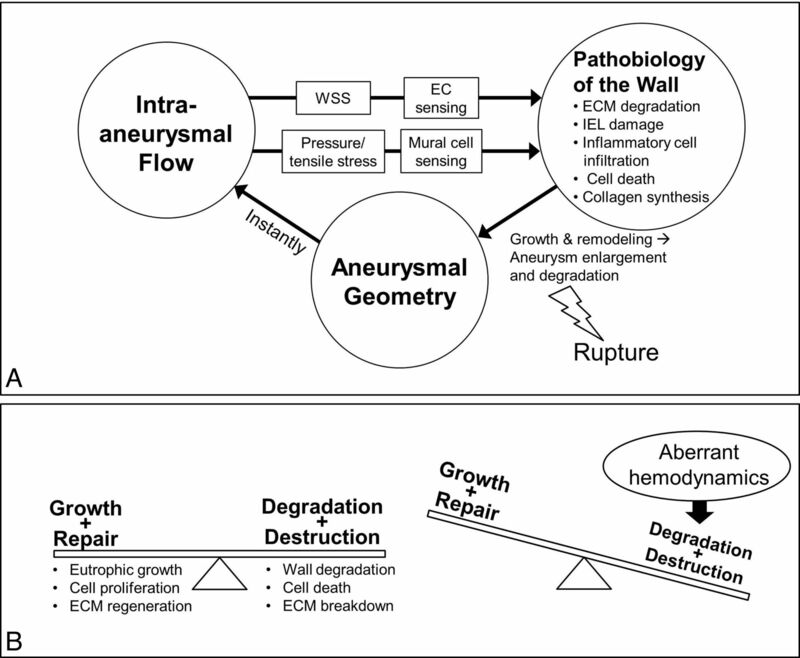 B, The balance between growth/repair and degradation/destruction results in aneurysm stability. Aberrant hemodynamics disrupts the balance and amplifies degradation and destruction mechanisms, leading to enlargement and rupture of aneurysm. Hemodynamics Plays a Critical Role in Intracranial Aneurysm Pathogenesis. A cerebral aneurysm is defined as a local outpouching of an intracranial artery exhibiting internal elastic lamina loss, tunica media thinning, and ECM degradation23 and can either be saccular or fusiform. The pathogenesis of fusiform aneurysms, with some exceptions,26 is closely related to atherosclerosis.27 Because a vast majority (>80%) of intracranial aneurysms are saccular,28 we will focus our discussion on this type of aneurysm. Recent studies in animal models have elucidated the pivotal role of hemodynamics in intracranial aneurysm initiation.25,34⇓⇓⇓–38 Flow acceleration adjacent to impingement points at bifurcations produces a complex hemodynamic environment of high WSS and a positive WSS gradient along the flow,4,37 which, through endothelium-mediated mechanotransduction, can initiate cascades of biochemical signals within the vessel wall and trigger aneurysm initiation.4,25,39 In a hemodynamics-only model of intracranial aneurysm initiation, Metaxa et al4 demonstrated that aneurysm initiation occurs when high WSS and positive WSS gradient exceed a certain threshold. This insult leads to local internal elastic lamina loss, media thinning, and bulge formation,4,25,36 the earliest signs of intracranial aneurysm formation. Prior to the initial aneurysmal damage triggered by hemodynamics, the cerebral vasculature may have already been weakened by various acquired (eg, cigarette smoking and hypertension)40,41 or inherited risk factors (eg, polycystic kidney disease).1 These factors compromise the ability of the cerebral vasculature to tolerate and properly adapt to hemodynamic insult,39 most likely by lowering the threshold for the onset of pathologic responses.42,43 Certainly, variations in hemodynamics and different risk factors among different individuals contribute to the heterogeneity of the disease. Many studies have tried to incorporate various aneurysm risk factors such as hypertension, decreased collagen cross-linking, and estrogen deficiency into animal models.34,44,45 In general, these studies have found that aneurysm progression starts with initial endothelial cell responses45 and smooth muscle cell phenotypic modulation, after which an escalating inflammatory response may be provoked, accompanied by ECM remodeling and degradation and cell death.46 These studies demonstrated that after intracranial aneurysm initiation, inflammation may play an important role in aneurysm progression (eg, inflammatory infiltrates produce matrix metalloproteinases, leading to wall degradation).34 These animal models demonstrated aneurysm development only when a hemodynamic insult was also applied. This reaffirms the conclusion that hemodynamic insult is necessary for intracranial aneurysm genesis. Aberrant Hemodynamics Can Disrupt Balance and Drive Intracranial Aneurysm Growth and Rupture. Different Manifestations of Intracranial Aneurysms. The first types are small aneurysms (<4 mm) with uniformly thin, smooth, hypocellular, translucent walls, through which reddish blood flow can be visualized at the time of surgical clipping. We refer to these as type I aneurysms (an example is seen in Fig 3A). The second types are entirely thick-walled large aneurysms (>10 mm), with an irregular surface on which whitish/yellowish atherosclerotic plaques obstruct the visualization of blood. We refer to these as type II aneurysms (an example is seen in Fig 3D). The third types are medium-sized aneurysms with a combination of thin- and thick-walled characteristics in different regions47,49 or with intermediate wall thickness.50 We refer to these as a combination type (examples are seen in Fig 3B, -C). According to Kadasi et al,50 the distribution of these 3 phenotypes in unruptured aneurysms is 27%, 8%, and 65% for types I and II and the combination type, respectively. These data suggest that intracranial aneurysm phenotypes exist on a spectrum: At one extreme is the small thin-walled phenotype (type I); at the other extreme is the large thick-walled phenotype (type II); and in between is a continuum representing an amalgamation of these 2 basic types. The recognition of different phenotypes in both incidentally discovered and ruptured aneurysms suggests that there may be a variety of nonconvergent hemodynamic-biologic pathways involved in the natural history of intracranial aneurysms. Rupture Potential versus Rupture Event. Why only some aneurysms are subjected to such catastrophe through routine activities is related to the vulnerable condition of their wall. Before rupture, the wall may have biologically remodeled and deteriorated with time,33 decreasing the wall strength to such a level that normal physical exertion could generate enough pressure to push the wall tensile stress over the limit (ie, exceeding the wall strength),33 rupturing the wall. Therefore, while the rupture episode itself is triggered by temporary pressure and/or frequency surge and wall failure, the predisposition of an intracranial aneurysm wall to rupture is due to biologic degradation, mediated by the interaction between hemodynamics and pathobiology with time. Understanding the nature and origin of the high-versus-low WSS controversy is important in developing quantitative guidance for physicians to make better intracranial aneurysm treatment decisions.15,16 Currently, the source of such heterogeneous findings remains elusive.16,17 Here, we speculate that this heterogeneity may reflect the inherent complexity of natural history of intracranial aneurysms and the diversity of growth and rupture mechanisms. Understanding the biologic processes activated by different hemodynamic conditions, such as high and low WSS, may shed light on possible mechanisms that lead to intracranial aneurysm growth and rupture. To address the conflicting CFD findings, we draw on the current understanding of hemodynamically induced pathobiologic responses in better described vascular pathologies in the literature (the pathogenesis of atherosclerosis and intracranial aneurysm). Such knowledge, summarized in the Table, helps us conceptualize possible roles of similar responses in intracranial aneurysm pathophysiology. High and Low WSS Can Drive Different Mechanistic Pathways of Intracranial Aneurysm Growth and Rupture. 1) Low WSS and a high oscillatory shear index can trigger inflammatory-cell-mediated destructive remodeling. 2) High WSS and a positive WSS gradient can trigger mural-cell-mediated destructive remodeling. By the pathobiologic effects in the Table, abnormal hemodynamic conditions of high and low WSS can disrupt the equilibrium between eutrophic and degradative processes in the intracranial aneurysm wall (Fig 2B).23 Specifically, both high and low WSS can incite proteolytic and oxidative damage, which causes ECM degradation and cell death, thereby facilitating aneurysm growth and rupture. This hypothesis lays the foundation for a conceptual framework that helps us begin to dissect the complexity of the hemodynamics-aneurysm pathophysiologic interaction. Figure 4 illustrates the unified role of hemodynamics throughout aneurysm development. Initiation of intracranial aneurysms is induced by a high WSS and a positive WSS gradient.4,37 Through endothelial cell mechanotransduction, these hemodynamic stresses initiate biochemical cascades when they exceed certain thresholds, leading to local production and activation of proteases (most important, matrix metalloproteinase −2 and −9) by mural cells,25 massive internal elastic lamina damage,4 and apoptosis,25 which are responsible for media thinning and bulge formation.37 Most interesting, inflammatory cell infiltration was not observed in early-stage intracranial aneurysm initiation,25 and macrophage depletion did not attenuate aneurysm formation, indicating that hemodynamic initiation of intracranial aneurysms is not mediated by infiltrating inflammatory cells. (M. Mandelbaum, J. Kolega, J.M. Dolan, A. Siddiqui, H. Meng, December 2012, unpublished data). 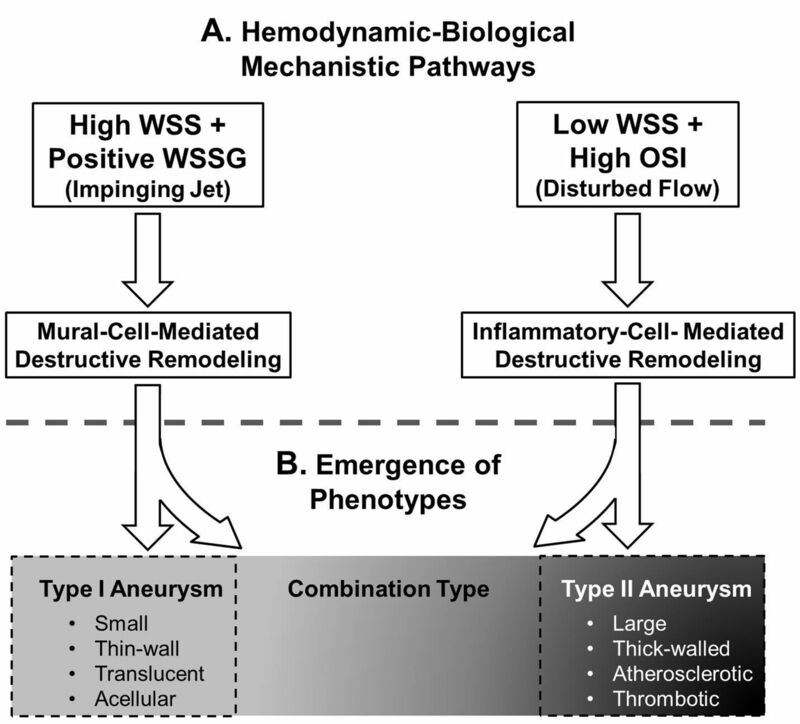 A unified role of high and low WSS in aneurysm initiation, growth, and rupture. Although leukocyte infiltration is not thought to be involved in the high-WSS-driven pathway, proinflammatory behavior could still be playing a critical role. Recently, it was found that in the internal elastic lamina damaged zones during intracranial aneurysm genesis, smooth muscle cells upregulated the proinflammatory proteins monocyte chemoattractant protein-1 and the transcription factor nuclear factor-κB, (M. Mandelbaum, J. Kolega, J.M. Dolan, A. Siddiqui, H. Meng, December 2012, unpublished data) and produced matrix metalloproteinase −2 and −9, which are required for aneurysmal degradation.25 These “inflammatory” smooth muscle cells lose some of their contractile phenotype by decreasing smooth muscle actin expression. In some ways, smooth muscle cells under high WSS conditions could act like inflammatory cells to cause aneurysmal remodeling. While some intracranial aneurysms may be dominated by one pathway, others could switch from one to another as the geometry changes (eg, during the initiation of blebs), as illustrated by the double-headed arrows between the branches in Fig 4. In some aneurysms, both biologic mechanisms might dominate different parts of the sac, depending on the local hemodynamic condition. The 3-way relationship among flow, pathobiology, and geometry (Fig 2A) can lead to further complexities in intracranial aneurysm pathophysiology, both longitudinally (at different time points) and cross-sectionally (at different spatial regions of the aneurysm). As these conditions change, so does the balance between eutrophic and destructive processes, resulting in either stabilization or rupture of the intracranial aneurysm (Fig 2B). Taken together, high WSS and low WSS are 2 aberrant hemodynamic conditions that could elicit pathologic remodeling pathways to drive intracranial aneurysm growth and rupture. Recognizing the heterogeneity of aneurysm phenotypes (see “Different Manifestations of Intracranial Aneurysms”), one cannot help but ask if these 2 pathways might be responsible for the 2 basic phenotypes (type I and type II) and if their interchange might account for the wide spectrum in between. We suspect that they do. Emergence of Different Intracranial Aneurysm Phenotypes. 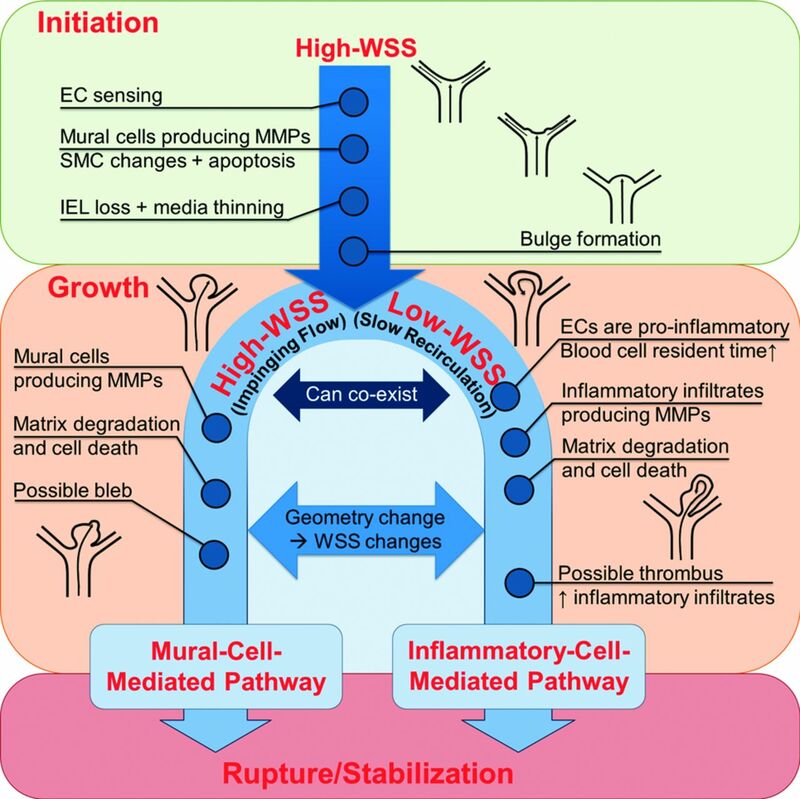 We further hypothesize that the high-WSS-driven, mural-cell-mediated pathway is responsible for type I aneurysms, while the low-WSS-driven inflammatory-cell-mediated pathway is responsible for type II aneurysms. The interplay between these 2 pathways, both longitudinally and cross-sectionally, contributes to the wide spectrum of combined intracranial aneurysm phenotypes. This concept is illustrated in Fig 5. Two hypothesized, independent, hemodynamic-biologic pathways that drive intracranial aneurysm growth and rupture (A) and the proposed relationship between them and the spectrum of intracranial aneurysm phenotypes (B). On the other hand, the large, thick-walled, atherosclerotic type II aneurysms appear to have developed during a longer period of time through various attempts to heal the sac.47⇓–49 Indeed, most inflammatory cells found in aneurysm specimens came from this type of aneurysm.52⇓–54 We therefore conjecture that the natural history of type II aneurysms (after initiation) is dominated by the inflammatory-cell-mediated pathway, as illustrated on the right side of Fig 5. The destructive remodeling here is accompanied by increased inflammatory cell infiltration and smooth muscle cell proliferation, especially after atherosclerotic plaque and/or thrombus formation.63,70 These processes lead to large, atherosclerotic, and thrombotic intracranial aneurysm phenotypes. We expect that both pathways can dominate different phases of intracranial aneurysm natural history and/or different regions of the growing aneurysm, thereby contributing to the wide spectrum of the combined type aneurysms. As the aneurysm geometry changes, so does the dominant flow condition (jet or recirculation) and the pathway it espouses. Aneurysms occurring in different locations and perienvironments, with varied morphologies and flow dynamics, are associated with complex genetic and environmental contributing factors, which could modify the vascular response to hemodynamics. As such, studies containing a limited cohort of intracranial aneurysms are inevitably based on skewed samples. It is not surprising that their findings sometimes do not converge. Additionally, conflicting CFD results have been rationalized by inconsistent parameter definitions, flawed experimental design, or variability in assumptions and compromises adapted in CFD simulations. These factors aside, we believe there is intrinsic mechanistic complexity concerning intracranial aneurysms, which underlies the high-versus-low WSS controversy. We submit that inconsistent findings about the role of WSS are principally a result of the inherent heterogeneity in intracranial aneurysm natural history and the diversity of hemodynamically driven growth and rupture mechanisms. A novel concept can help delineate such complexity: Aberrant hemodynamics including both high WSS and low WSS can tip the balance that maintains vascular homeostasis and can drive destructive remodeling to cause intracranial aneurysm progression and rupture. We propose that 2 independent hemodynamically driven biologic pathways could be associated with intracranial aneurysm growth and rupture: an inflammatory-cell-mediated pathway that is induced by low WSS and a high oscillatory shear index, and a mural-cell-mediated pathway that is induced by high WSS and a positive WSS gradient. Furthermore, these 2 hemodynamic-biologic pathways may be responsible for the 2 aneurysm phenotypes: large thick-walled atherosclerotic aneurysms (type II) and smaller thin-walled translucent aneurysms (type I), respectively. These processes reflect the variations in the tripartite interactions of geometry, flow, and pathobiology, which become apparent in the spectrum of intracranial aneurysm phenotypes. Each phenotype attempts to re-establish homeostasis between the eutrophic and destructive forces. If homeostasis is achieved, the aneurysm stabilizes; if not, it ruptures. We argue that the high-versus-low WSS controversy is a manifestation of the heterogeneity in intracranial aneurysm pathophysiology and its intricate relationship with hemodynamics. Going forward, we expect that large, multicenter, global studies will be needed to obtain a more comprehensive picture of intracranial aneurysm hemodynamic pathophysiology and to develop more reliable risk-prediction models. This effort will likely require better classification of aneurysms (eg, based on aneurysm size, location, phenotype, perienvironment, and patient population), rather than treating them as a conglomeration. Different predictive models could be extracted from different classes of datasets and applied to intracranial aneurysms that belong to specific categories. For example, statistical analyses of small aneurysms may produce a different set of predictive parameters (related to high WSS and a positive WSS gradient) from that of large aneurysms (related to low WSS and a high oscillatory shear index). We envision that intracranial aneurysm cases could be carefully classified and then subjected to the appropriate predictive models. The models should reflect the underlying mechanisms driving aneurysm growth and rupture. As such, intracranial aneurysm classification based on size alone may not be highly accurate. An alternative strategy would be to identify type I and II aneurysms from imaging and then to perform subgroup risk analyses and management. There is a need to study the role of hemodynamic-biologic interactions in the natural history and rupture propensity of intracranial aneurysms in experimental models. Animal models commonly used for clinical studies are good for testing medical devices and investigating hemodynamics71 but are generally biologically deficient. On the other hand, current endogenous models34,37 capture some hemodynamic-biologic effects in the early stages of aneurysm formation but lack the ability to study growth and rupture. Therefore, improved animal models, aided by advancements in in vivo and molecular imaging, are needed to elucidate the hemodynamic-biologic mechanisms driving aneurysm growth, and models of aneurysm rupture must be developed to study the hemodynamic and biologic mechanisms involved in rupture. Patient-specific CFD studies must be complemented by hemodynamic-biologic mechanistic studies because these 2 approaches are mutually informative and beneficial. Analysis of patient-specific CFD results may generate new questions concerning the pathophysiology of intracranial aneurysm (ie, which mechanistic studies should be investigated). Meanwhile, mechanistic studies based on animal models can help analyze and interpret the results of patient-specific CFD studies to facilitate the generation of future predictors. The unifying hypothesis presented in this review may serve as a starting point to guide the design of these future endeavors. We anticipate that joint effort among clinicians, engineers, and basic scientists focused on better understanding aneurysm pathophysiology will lead to better risk prediction and management of intracranial aneurysms. We are grateful for stimulating discussions with Dr Charles Strother, and H.M. is grateful to Dr William L. Young for his mentorship. Disclosures: Hui Meng—RELATED: Grant: National Institutes of Health/National Institute of Neurological Disorders and Stroke R01NS064592. * Adnan Siddiqui—UNRELATED: Board Membership: Codman & Shurtleff, Comments: Advisory Board; Consultancy: Codman & Shurtleff, Concentric Medical, ev3/Covidien Vascular Therapies, GuidePoint Global Consulting, Penumbra, Stryker Neurovascular, Employment: University at Buffalo, Kaleida Health, Grants/Grants Pending: National Institutes of Health, University at Buffalo, Payment for Lectures (including service on Speakers Bureaus): Codman & Shurtleff, Genentech, Stock/Stock Options: Hotspur, Intratech Medical, StimSox, Valor Medical, Travel/Accommodations/Meeting Expenses Unrelated to Activities Listed: Covidien,* MicroVention,* Other: Penumbra, Comments: serve on National Steering Committee for Penumbra, Inc, 3D Separator Trial (no compensation received). * Money paid to the institution. This work was supported by grants to H.M. from the National Institutes of Health (R01NS064592) and Toshiba Medical Systems.